The battleground that gave birth to the Republic of Texas has been surrounded by an army of refineries and chemical plants. The monument in the center of the battlefield is a bastion defending genealogical and historical treasures. My birthday celebration last Friday seemed like the perfect occasion to visit the monument, the museum and the library in the center of the San Jacinto Battleground State Park. A visit to the library requires an advance appointment but it is a simple matter to use the contact information on the website to make arrangements for your visit. There is only one table available for research. The library floorspace is devoted to bookshelves and file cabinets. The top of the Library page http://www.sanjacinto-museum.org/Library includes a virtual tour of the Library. The ceilings of the library are at least fifteen feet high and the walls are packed to the rafters with books. Only one or two researchers can be accommodated at the same time. 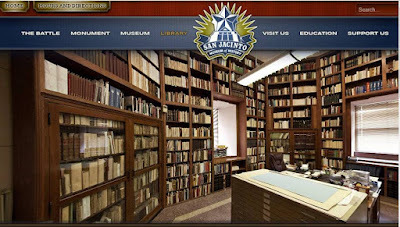 The library webpage includes a 360 degree virtual tour that shows the small room and the stacks of books. 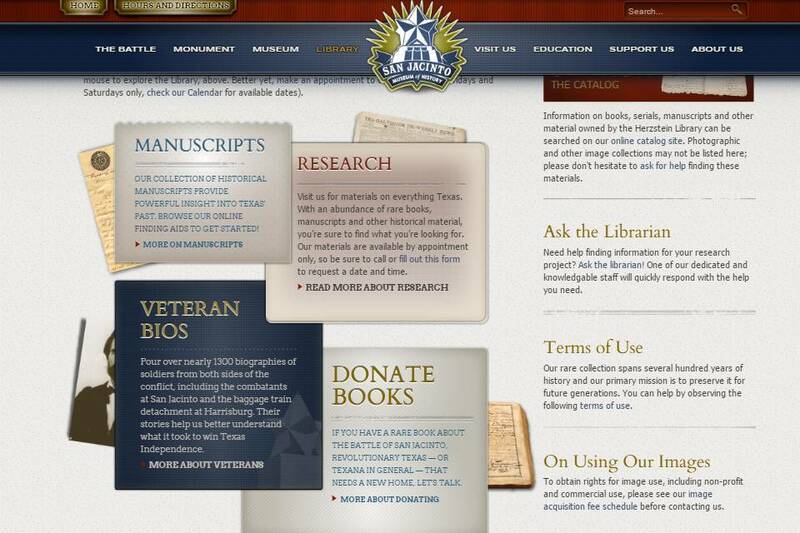 This shows the links to the manuscripts, research procedures and the veterans biographies. Please examine the website thoroughly before your visit as it contains a wealth of information about the library and includes online biographies of battle veterans. I am not sure how we missed them on the way in but a collection of murals can be seen on oil tanks on Independence Parkway and Highway 225. The murals are most visible as you exit the park. 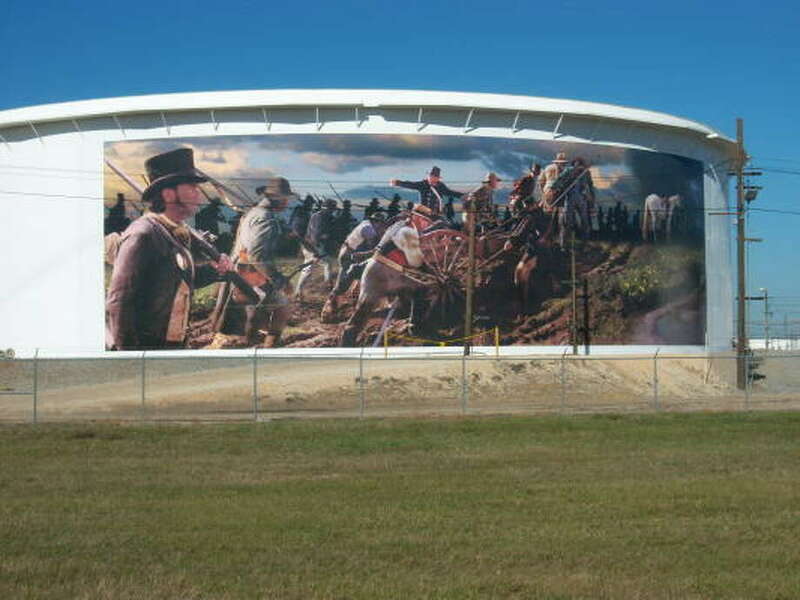 I found a vast array of oil tank images and articles using the following search terms: "san jacinto oil tank murals". These murals are quite impressive and have garnered attention from journalists across the country. 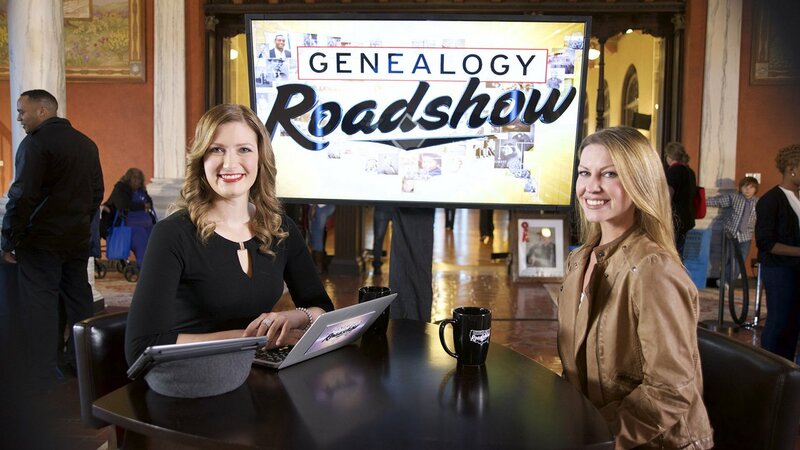 Genealogy Roadshow host, Mary Tedesco revealed a San Jacinto battle veteran to Sarah Lasater on the Houston Episode. The Houston episode of Genealogy Roadshow includes the discovery of a veteran of the Battle of San Jacinto. I interviewed Sarah Lasater after the filming of the Houston episode and wrote a blog about it here. The biography for her ancestor, Francis Laster is found here. For more information on visiting this state historic site visit the website of the Texas Department of Parks and Wildlife.